Hockey doesn't have a lot of iconic movies. 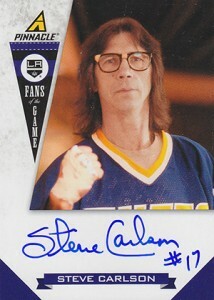 Slap Shot is one of them, though. 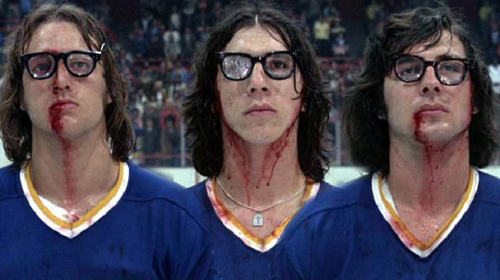 A big reason for the film's lasting popularity is the Hanson Brothers, a trio of tough thugs who wear thick glasses and made putting on the foil cool. 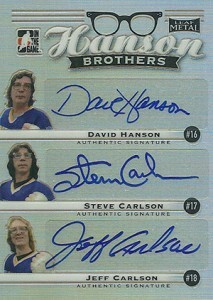 The Hanson Brothers were played by a trio of professional hockey players: Dave Hanson and brothers Jeff and Steve Carlson. All three spent some time in either the NHL or WHA, although they made a bigger impression with Slap Shot than the did playing for the big leagues. Over the years, the Hanson Brothers' iconic status has translated into a decent amount of memorabilia, including signed jerseys and even McFarlane figures. 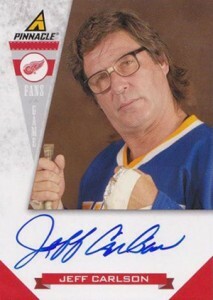 And while there are some Hanson Brothers hockey cards, there aren't a ton. Here's a breakdown of what you can find card-wise, both as a trio and as individuals. Click on the images or listings to shop for cards on eBay.